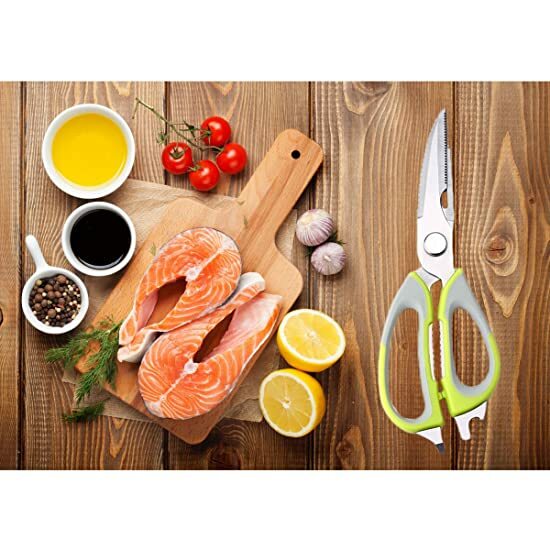 The LAFALA kitchen scissor has perfect performance for kitchen tasks: it can be used as a fish scaler, bone cutter, can opener, herb scissor, fruit n vegetable peeler/rot digger, screw driver, bottle opener and nut cracker.Could be used not only in kitchen, but also in warehouse, garden or any household task. Easy to clean & use. 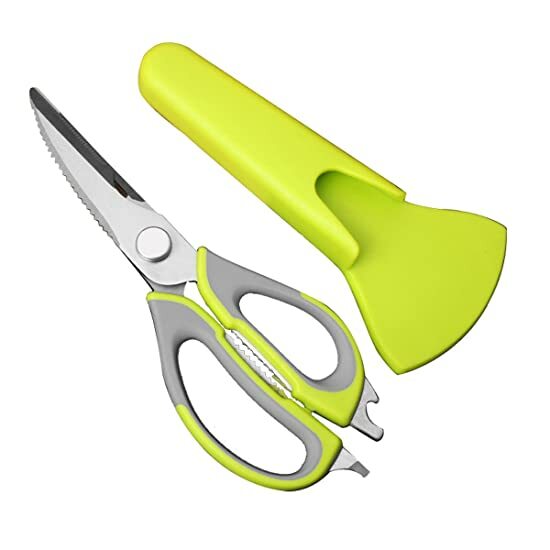 This scissor could be separated into two knives. You can clean the scissor fastly to save your time! It is made of heavy duty, long-lasting carbon stainless steel metal. To make sure the shear is tough & sharp enough so you can slice or shear the hard food easily and safty. - Before using, remove all packaging. 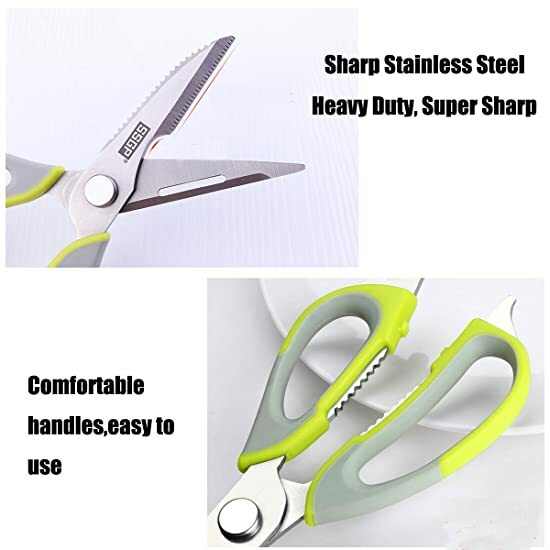 The scissors are very sharp and can easily scratch your hands; use with coution, ensuring the blades are pointing away from you. - Firmly hold the scissors by placing your thumb into the smallest handle and your forefingers into the other. Depending on the toughness of the boject being cut, determine whether to use the tip, middle or inner-most part of the blades. For other uses, please refer to images on front of the color box or the pics that shown in our products list. 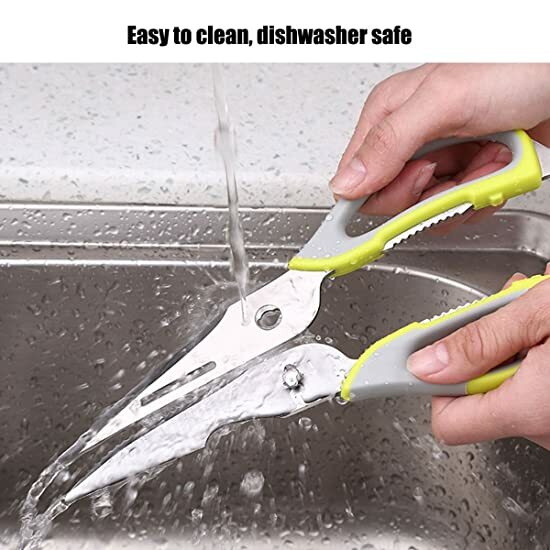 - After use, clean the scissors and store safely out of children's reach. 1 x Magnetic Storage Case. 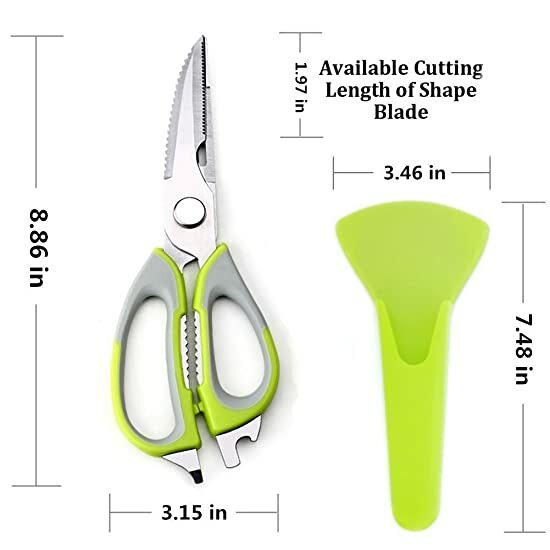 Dimensions: Scissor length: 9 inches. Magnetic Storage Case: 7.48L*3.46W inches. 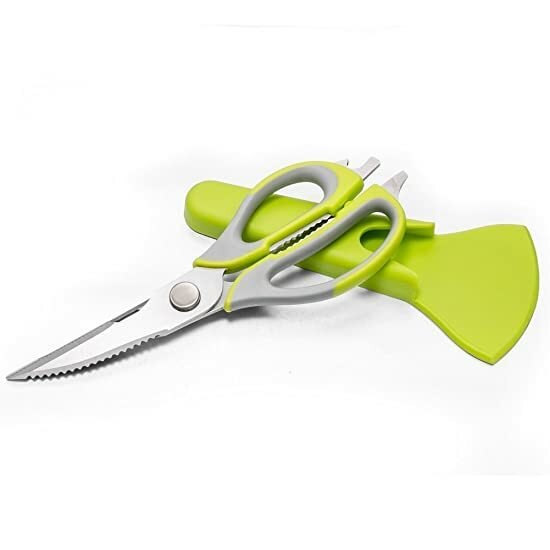 - If you're not completely satisfied with our kitchen scissor, simply let us know and we will give you a full refund. Enjoy this absolutely RISK FREE purchase today. Please notice: Children need to use it with their parents to avoid hurting themselves. COMFORTABLE GRIP HANDLES: Soft-grip handles don't slide when your hands are wet. It is much convenient for you to chop the chichen by using a knife. 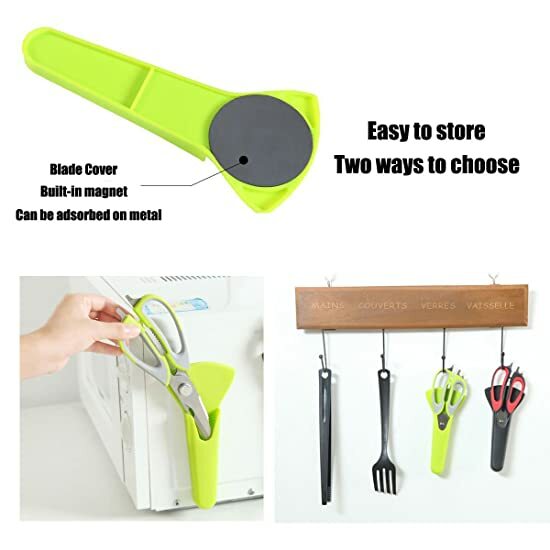 A magnetic storage case is included, the magnet is strong enough to hold both itself and the scissor on the fridge, children could not get it easily. 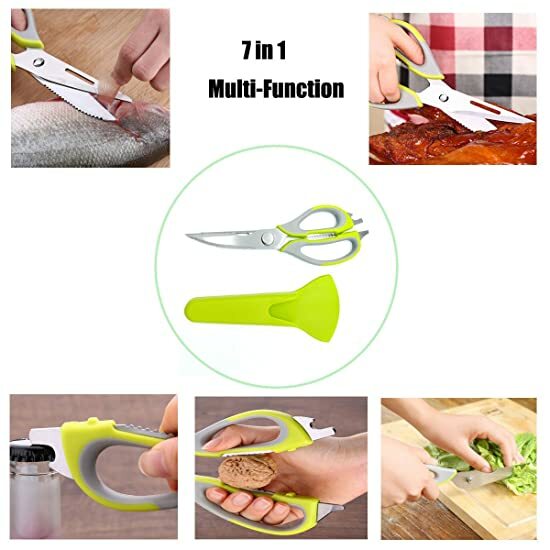 PERFECT PERFORMANCE FOR KITCHEN TASKS: These culinary scissors are great for cutting meat, ribs, chicken wings, vegetables, poultry, bones etc. It means you do not need a massive cutting board and knife. Effortless operation makes your life easier. ADDITIONAL FUNCTIONS: Use multi-function kitchen shears for opening bottles, cracking nuts, cutting bone, scraping fish scales. These are common needs in the kitchen. Staying true to its mission of staying focused and performing well on existing functions.It can be separated into two parts, we recommend manual cleaning and drying to prevent the growth of bacteria. USE OUTSIDE THE KITCHEN - You could use it everywhere. It can be used not only in the kitchen, but also in warehouse, garden or any household task. Trimming flower stems, cutting papers and much more. It is dishwasher safe, although hand wash is recommended. MONEY BACK GUARANTEE - If you're not completely satisfied with our kitchen scissor, simply let us know and we will give you a full refund. Enjoy this absolutely RISK FREE purchase today.